Kathleen Flinn has been a writer and journalist for nearly twenty years. Her work has appeared in the Chicago Tribune, the Chicago Sun-Times, USA Weekend, Men’s Fitness, and many other publications. She is a proud member of the International Association of Culinary Professionals, the American Society of Journalists and Authors, and the Author’s Guild. She divides her time between Seattle and southwest Florida. "This could be the most important book you'll ever read." 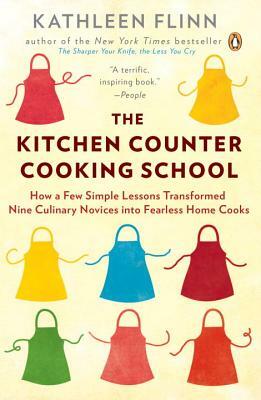 "If you are going to read one book to change your diet and your life, The Kitchen Counter Cooking School is it." "Kathleen entered the kitchens of strangers and took the time to understand how they think about food before changing their cooking forever." “A life-changing book--entertaining, inspiring, and deeply educational." "An engaging...book on the joys of home cooking and the teaching thereof." "The author''s humble approach is inviting and shows why her students were enthusiastic." "Flinn guides you patiently in the kitchen like the mom you always wish you''d had to learn to cook from...the women gained confidence under Flinn''s wonderfully encouraging tutelage, and fearlessly faced their kitchens and grocery stores with useful knowledge." "Flinn winningly offers inspiration to anyone who cares about cooking but lacks basic tools and skills." "An amiable companion to cookbook stalwarts such as Mark Bittman''s How To Cook Everything, Pam Anderson''s How To Cook Without a Book, and Michael Ruhlman''s Ratio, this title provides encouragement where the others offer direction. A mash-up of inspiration and reference, it will appeal to readers who enjoy a story with their instruction."